When I was at PCMI in the summer of 2010, I was part of a Japanese Lesson Study group. I realized I never posted some of the good work we created, probably because I never got to use this in my own classroom (it was never a curricular topic in a course I was teaching). However I do know this is a great lesson because we taught it twice (revising in between) to both adults and to actual students. The quick rundown of first half rundown which is presented below: Initially, students participate in a launch task that gets them thinking about the meaning of words like “if,” “then,” “not,” and the importance of precision. 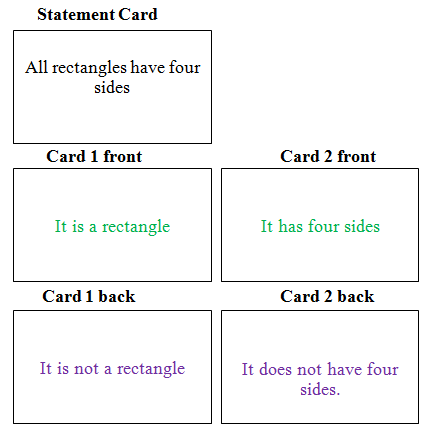 Then, in pairs, students work with index cards to take a statement like “All squares have four sides” and create four statements out of that (the conditional, the inverse, the converse, and the contrapositive) and determine the truth value of each statement. The students still have not learned the vocabulary words for each of these statements. However, they will be playing around with the main ideas. Each pair is working on a different statement, and makes a poster with each of the four statements, and the class goes on a “gallery walk” to see what the other groups have done. Then finally the whole class comes together and does one example together, finally providing the vocabulary words for each type of statement and solidifying what these four statements are and how they are constructed. What happens next, which is not presented below: Part two of the lesson involves the introduction of Euler diagrams, and a more focused look at the truth or falseness of each of the kinds of statements. First students will generalize from their posters. Then students will use Euler diagrams as a way to justify their reasoning. Finally, they will have an individual exit task to test their understanding. If Students Learn, Then We’ve Accomplished Something. a. 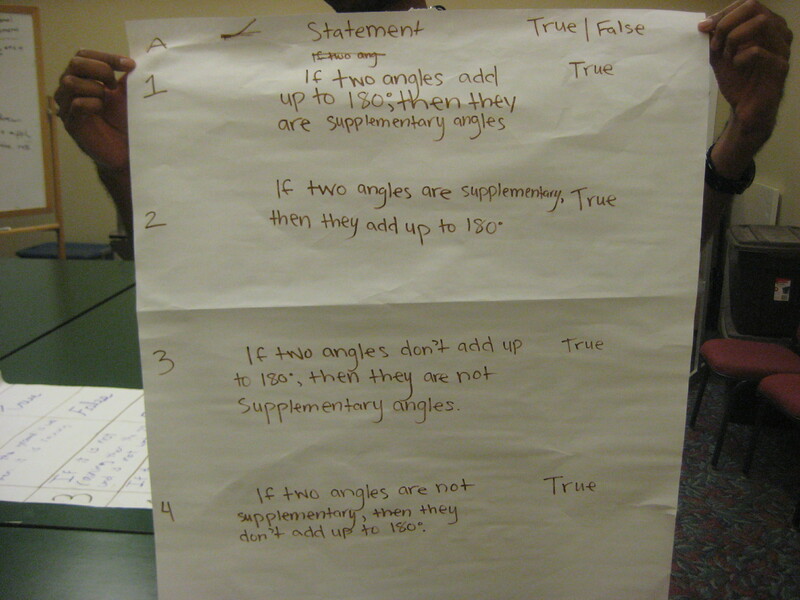 Students will develop a conceptual understanding of the converse, inverse, and contrapositive statements, and will be able to use multiple models (specifically Venn diagrams and sentences) to reason about these statements. b. Given an assumed true conditional statement, students can distinguish and clearly explain the truth values of the inverse, converse and contrapositive statements – using counterexamples to show the falsity of statements. c. Students will develop an appreciation for the precision of language, and usefulness of if-then statements. This lesson aims to enhance students’ abilities to construct viable arguments (item 3 above). The CCSS for Mathematics further elaborates on this standard on their website. 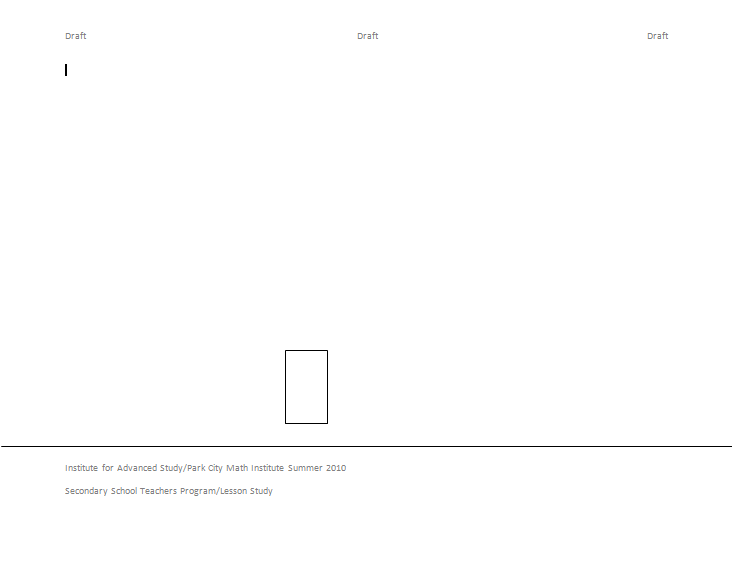 The students will be given a piece of paper with either a rectangle or a triangle and a horizon. The instructions for the students to complete the task will be read aloud simultaneously while shown on the powerpoint. The teacher will pause distinctly after the hypothesis and before the conclusion for each statement. No questions will be allowed. Teacher instructions to student: Explain the directions to the task, and also to assure students that any questions or interesting points they come up with will be addressed afterwards. Students are not allowed to talk at all. 1. If you have a rectangle on your paper, then sketch a square around it. 2. If you have a triangle on your paper, then draw a congruent triangle approximately three inches to the right. 3. If you do not have a triangle on your paper, the sketch an equilateral triangle above the largest quadrilateral. 4. If you have exactly two triangles on your paper, then sketch a square using the top vertices of the two triangles as the base of the square. 5. If you have a square on your paper, then sketch a circle in the upper right hand corner of your paper. 6. If you don’t have two triangles on your paper and do not have a circle on your paper, then sketch a flower in the lower right hand corner of your paper. 7. If you have only one triangle on your paper, then sketch a thin rectangle sticking out of the left hand side of the triangle. 8. If you have a flower on your paper, then sketch two more flowers next to it. 9. If you have two triangles and one square on your paper, then sketch a smaller square on top of the square. 10. If you have a single circle and no flowers on your paper, then sketch a smiley face in the circle. 11. If you do not have a flower and you have an even number of squares and an even number of triangles, sketch a sad face in the smaller square. 12. If you don’t have any flowers on your paper, then sketch five flowers on the right side of your paper, slightly above the line that was on your paper when you received it. 13. If you don’t have a smiley face on your paper, then don’t sign your names on the bottom left corner of your paper. 14. If you have more than one flower on your paper, then don’t sketch three more flowers. 15. If you have a circle in a corner of your paper and an even number of squares and an even number of triangles, then sketch two thin rectangles coming out of the left and right sides of the largest square. 16. If you don’t have an even number of flowers, then sketch two stick figures on the left side of your paper, slightly above the line that was on your paper when you received it. 17. If you don’t have an odd number of flowers, then sketch three stick figures on the left side of your paper. 18. If you have more than one stick figure, sign your names on the bottom right corner of your paper. At the end of the task, each student will have a drawing on their page. The teacher will instruct the students to stand up and find other student’s work and find similarities and differences. Teacher will go through these questions below. Teacher will spend more time on the discussion of strategies than the other topics. 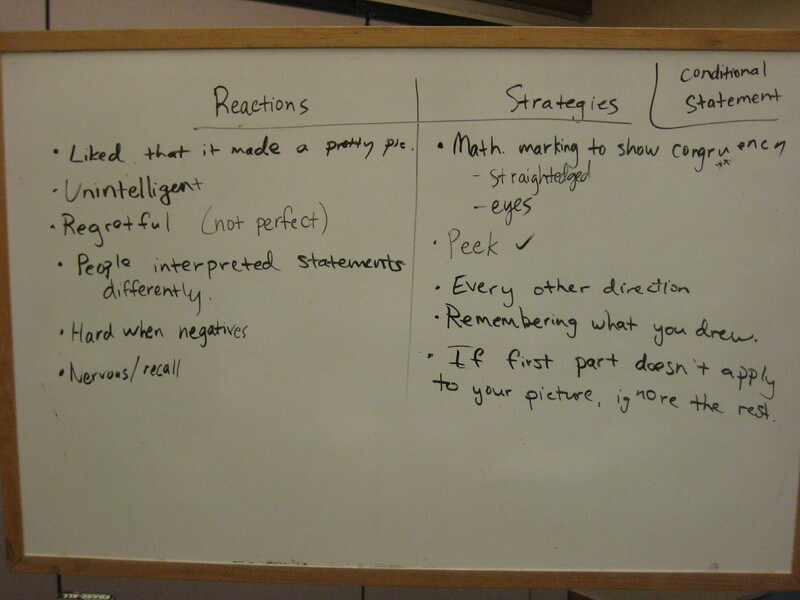 Teacher will record “reactions” and “strategies” on the chalkboard while leading the discussion. 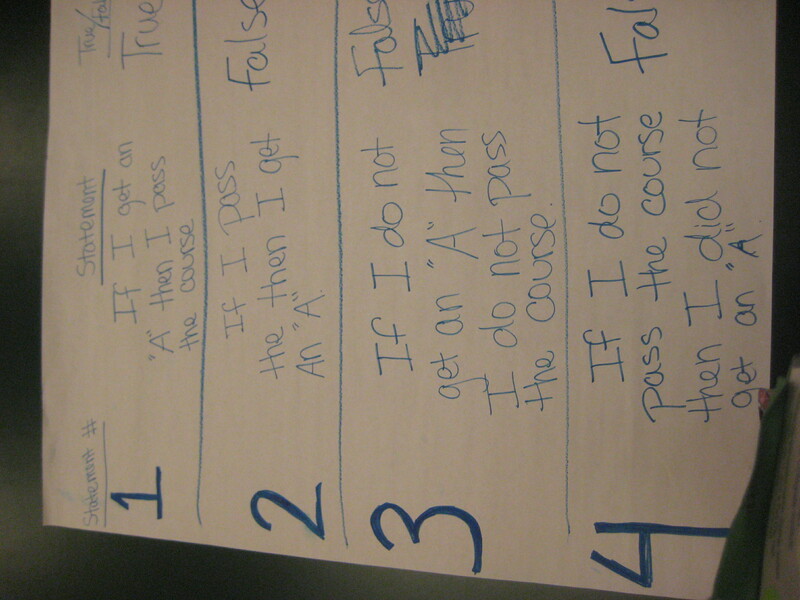 During the discussion, the teacher needs to highlight near the end of the strategy discussion that these if-then statements are conditionals, because that is one of the major goals of the launch. How did you feel when you completed the task? What did you notice as you shared your work with other students? What did you find easy about completing the task? What did you find difficult about completing the task? What strategies did you use to decide whether to draw something or not? As a side note: we did not show the correct pictures with the class. Instead, we wanted to focus on the thinking process, not the result. Students will be allotted approximately 15-25 minutes to work in pairs and complete the table AND poster. This directions to the activity asks students to mix up the green and purple index cards in such a way that they will generate the original conditional statement, and also the inverse, converse, and contrapositive. The names for these statements are purposefully not given at this point. We want students to focus on the actual statements themselves, and use this as motivation for the need to have names for these statements. 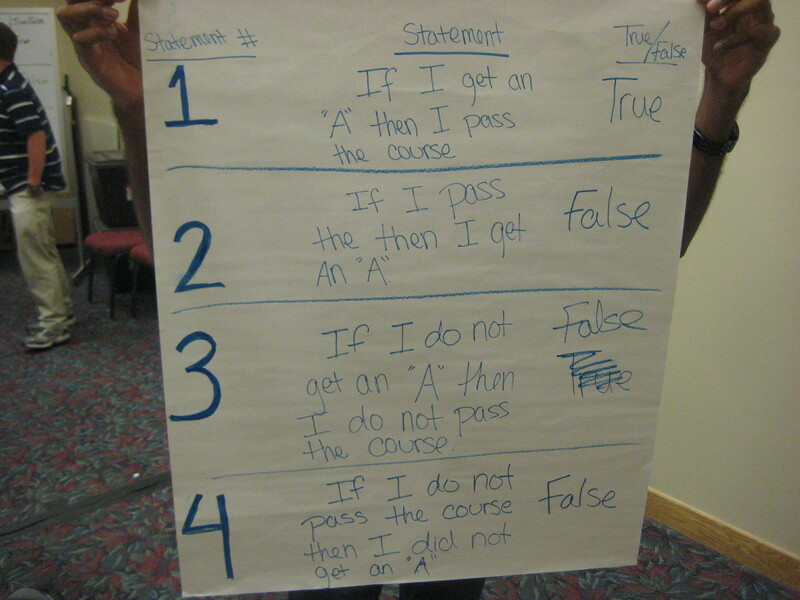 For each statement (the original, the inverse, the converse, the contrapositive) the students is asked to determine the truth or falseness of the statement. 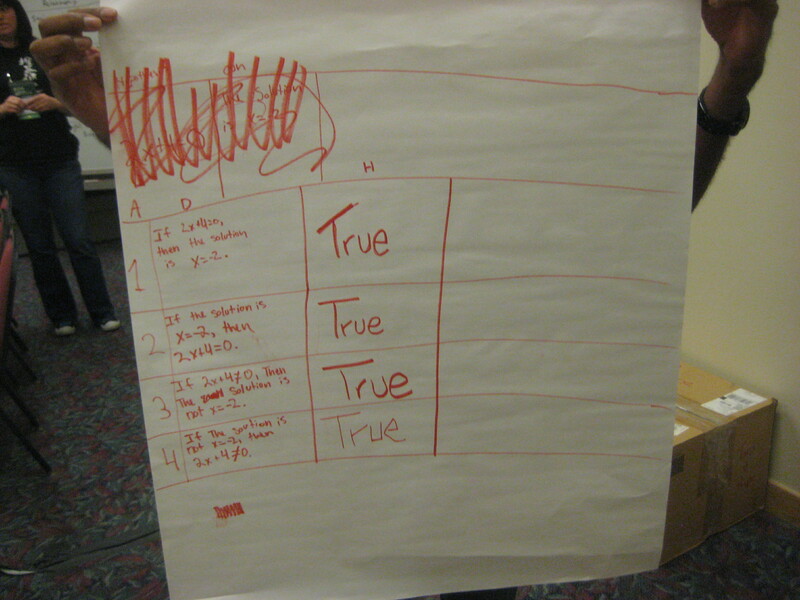 One student will be the recorder (“little paper person”) and fill out the table while the other student will write the completed statements and whether they are true or false on the larger poster paper (“big paper person”). At the conclusion of the activity, the student pairs will post their posters on the walls. The teacher will ask each group to stand up and walk around to observe what is written on the posters. 1. Which statement really strikes or puzzles you? 2. What patterns do you notice? 1) If you have a driver’s license, then you are at least 16 years old. This is almost the same activity that the pairs did individually, except now that the gallery walk is over, the class will be doing this exercise together. Importantly, the names will be given for each of the statements (conditional, inverse, converse, contrapositive) and a discussion of the truth value of each of those statements will ensue. Teacher leads discussion of relationship between sentences and gives each type a name. 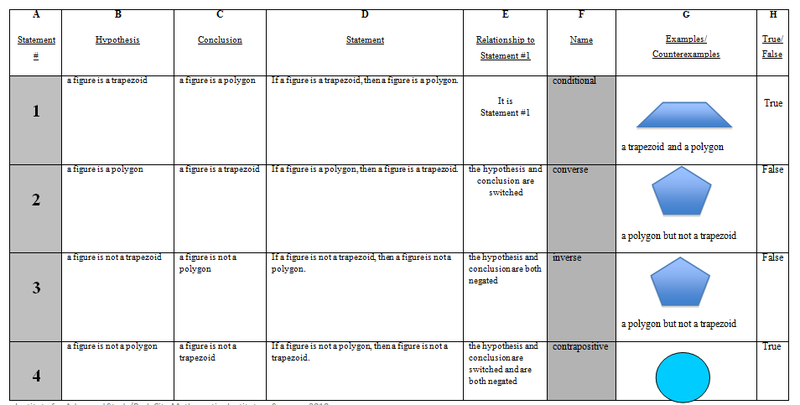 In particular, teacher will ask how Statement 1 in each case was restructured to create Statement 2. Teacher will record student answer (something like: “change the first part and the second part”) on the board. Teacher will identify this as the converse and ask a student to state the converse of the statement “If you have a driver’s license, then you are at least 16 years old.” Teacher will not yet address the truth value of any of the statements. Teacher repeats this discussion for inverse and contrapositive. Students record the names “conditional, converse, inverse, and contrapositive” in Column G of their organizer as the names are announced during the discussion. After this discussion where students have been given the vocabulary to talk about the statements, the teacher will lead a discussion about the gallery walk – using a shared language. 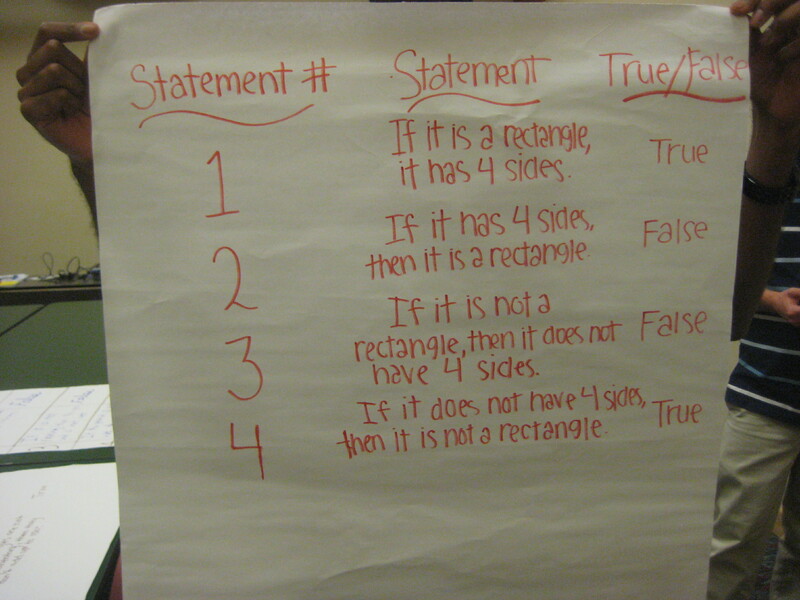 How did your group decide if a statement was false? What patterns did you notice from the gallery walk? With that, the first half of the lesson is over. 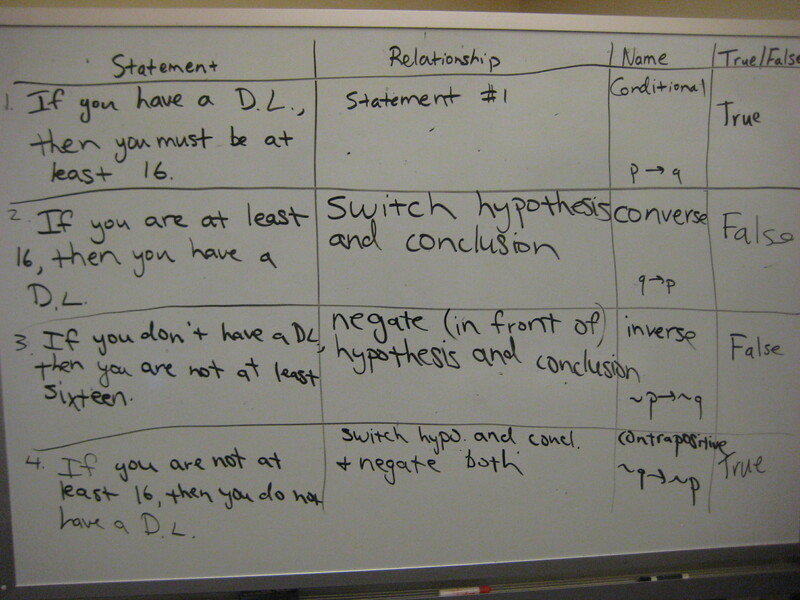 At this point, students understand the meaning of the conditional, inverse, converse, and contrapositive and have had some experience trying to decide the truth and falseness of each of these statements. However, the second half of this lesson would really focus on the truth-value of each statement. 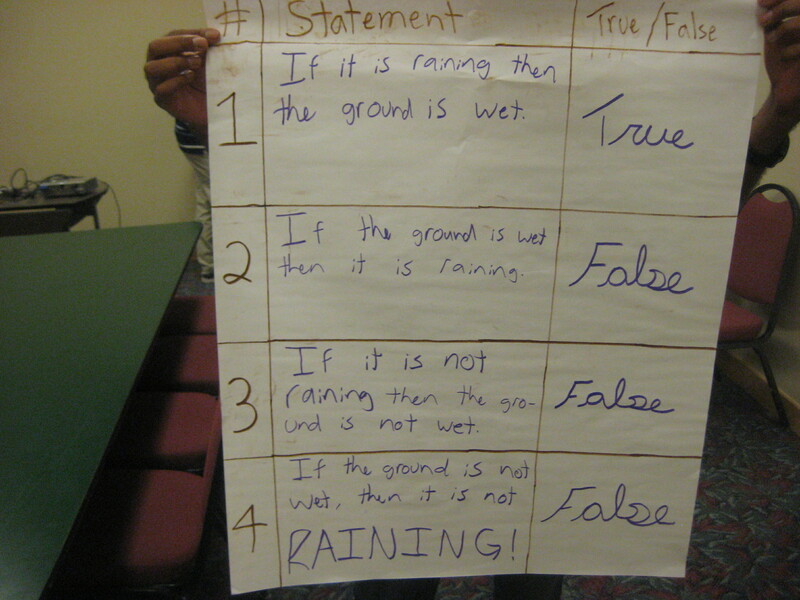 Importantly, by the end of the second half of this lesson, students would not only be able to identify a statement as true or false, but would be able to justify their reasoning both using words, examples and counterexamples, and Euler diagrams. Sorry I’m too lazy to put up the second half of this lesson. But there’s some good stuff in the first half! I love this lesson- I think it plays out in a very elegant way. I will definitely be using this in my geometry class this year. Thank you for sharing! I think it’s vital to debrief and discuss and I just really like how the lesson is set up. Did your group create a whole unit individual lessons? Thanks! I thought so too. We wanted a LOT of mathematical talking among students — without it all “seeming” like traditional math. And we wanted it building up, and for students to figure stuff out themselves. And this topic was good for that. Listening to students talk about the truth/falseness of statements was the most interesting. We pretty much created just this – and the second half… which was in more inchoate form in our documents, so I was too lazy to translate that into a good form to put online. It took me FOREVER just to figure out what the heck we were doing for the first half. But I don’t know if that answers your question or not. This was about it. I really like the approach to this foundational geometry lesson. I will be using this in the fall in my classroom and will provide you with feedback after doing so. Is it possible for you to provide a brief outline of the 2nd lesson involving Euler diagrams? I will be much obliged if you are able to do so. The fundamentals of conditional statements, including “if and only ifs” (iffs) and the Euler diagrams that illustrate them, is often a struggle for the developing high school sophomore’s mind, and consumes more time than I wish in the overall scope and sequence of the course. 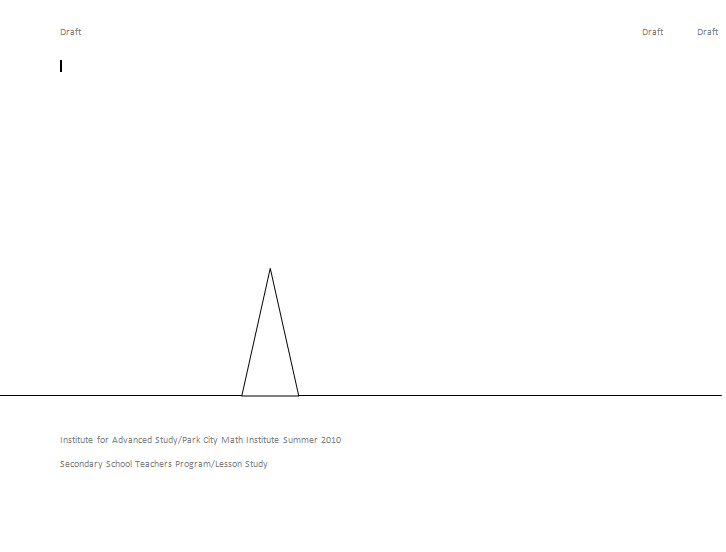 Yet those who successfully gain understanding here are undeniably more likely to succeed in the balance of the course. As this unit is such a key determiner of future success, in geometry and beyond, it is clearly worthy of the time and effort to improve upon in every geometry classroom. Thanks for your efforts and willingness to share! I’m so sorry – but ti’s been so many years since I did this, and I don’t actually have any of that material anymore. I wish I had been more on top of things and actually blogged it in the moment. Sigh! But if you do make a follow up, will you link to it back here in the comments so I can use it in the future? Thanks for the great resource. I am teaching geometry for the first time and struggled with figuring out an interesting/engaging way to teach this topic. This helped a lot. Now I just need to figure out how to teach the second half of the lesson! Thanks for the resource. I am using part of this to teach the conditional structure in Computer Science.